Be pampered by our friendly staff from the moment you arrive with a warm smile and refreshing cocktail. Singles, couples, families, friends, groups and business travelers are all welcome to enjoy this beautiful gem. Its incredible location is within minutes to local attractions such as Pigeon Island National Landmark, Reduit beach, IGY Marina, Dive St. Lucia, Gros Islet street party, Casino, duty free shopping malls, specialty restaurants and hip bar. All of which provides the perfect opportunity to enjoy an exciting, fun and relaxing atmosphere, explore an extraordinary tropical island as well as enjoy the unique Saint Lucian culture and people. Enjoy a relaxing nap or sip on some wine from the comforts of your private sanctuary; or tantalize your taste buds with a scrumptious meal prepared by our one of a kind chef. Drift away into a land of tranquility by our uniquely shaped pool while the cool breeze caresses your skin. 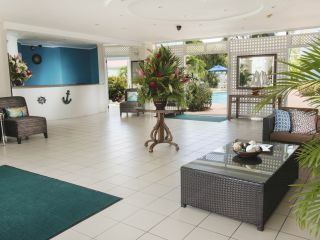 The hotel is within a five-minute drive of our sister properties the Bay Gardens Inn and Bay Gardens Hotel and 10 minutes from the Bay Gardens Beach Resort & Spa. Come over via our complimentary shuttle service and enjoy the full benefits of a Bay Gardens experience, including six complimentary one-hour passes to Splash Island Water Park, the use of beach chairs and gym, the ability to charge consumption across properties to their rooms, and free non-motorized water sports. Bay Gardens Marina Haven is scheduled to re-open its doors on July 10, 2018. Bay Gardens Marina Haven your escape to paradise.